Valerie Byxbe vowed never to go to college, and she kept her word for a good while. For Byxbe, who graduated from a performing arts high school in Jacksonville, Florida, there would be no nine-to-five, no cubicles; it would be the free-spirited life for her. She moved to Asheville, North Carolina, where she became a yoga instructor and a professional belly dancer. After five years, Byxbe assessed her situation. Asheville was saturated with yoga teachers. “You can’t swing a cat around there without hitting one,” she said (adding quickly that in no way does she condone cat swinging). If she wanted to advance in the profession, she’d have to open her own yoga studio or move on. The competition would be fierce, and Byxbe also realized that she wanted something else: income stability. “The more I thought about it, the less important it was to just willy-nilly do whatever I wanted,” she said. She returned to Jacksonville and taught dance while she figured things out. Her decision had grown from deep-seated worries. Byxbe’s family had struggled. Despite her mother and father’s hard work, money was always tight. Medical care for Valerie and her younger brother, Jonathon, meant urgent care clinics, because they were the only affordable option. On top of that, she battled a medical condition that affected her breathing and which turned high school into an ordeal. 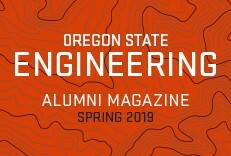 In 2011, Byxbe, then 26 years old, entered Oregon State’s College of Forestry. But two years later she took stock again, and that led, improbably, to engineering — a decision that still surprises her. Convinced of her potential, Byxbe’s advisors and teachers urged her on. After changing to the engineering track, she enrolled in algebra classes at a local community college to bone up on her math, which she hadn’t studied for a decade. Along the way, she held down various jobs and completed two NASA internships. But as her senior year approached — her sixth year at Oregon State — Byxbe confronted the frightening prospect that she wouldn’t be able to pay her bills — wouldn’t earn her degree after all. Her fear was palpable and at times debilitating. She took a second part-time job and looked for help wherever she could find it. “I was panicking,” she said. 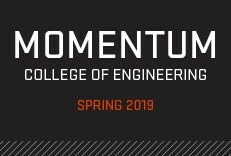 Relief came just weeks before the semester began in the form of a $3,000 scholarship from Eric (’79 B.S., Construction Engineering Management) and Janice (’81 B.S., Business Administration) Hoffman, both OSU alumni. Half a dozen faculty and advisors had nominated her for the award. “In the big picture, people may not think it’s a lot of money, but it absolutely is,” Byxbe said. “It closed the gap, it allowed me to graduate, and I can never thank enough all the people at OSU who supported me as well as the Hoffmans for their generosity." 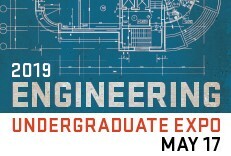 Last June, she received her bachelor’s degree in industrial engineering. In July, Byxbe headed to Rockwell Collins in Cedar Rapids, Iowa, which hired her as a systems engineer. She works on human-machine interface for the next generation of military helicopters. “It’s very much my dream job,” she said.